Antifa Has Richard Spencer on the Run. Does That Vindicate Its Tactics? There’s good reason to believe that antifa’s success has come despite violent tactics, not because of them. At The Intercept, Natasha Lennard writes that “Spencer’s statement, celebrated by antifa groups and supporters across social media, offers a sharp rebuttal to the glut of claims that antifa practices serve as a gift to the far right.” For Lennard, Spencer’s acknowledgement that antifa activists have taken the “fun” out of being a fascist settles a longstanding argument about antifa’s tactics. Lennard is right to call out “a cottage industry of panicked media commentary [that] has dedicated itself to decrying the threats that antifa and its ‘no-platforming’ stance pose to free speech.” As UC Berkeley Chancellor Carol Christ said last year, “Free speech has been adopted by the alt-right as one of its strategies to construct a narrative about universities that is extremely useful for their political goals.” There have been scattered incidents of violence by campus activists, including antifa members, but most of the mainstream “free speech debate” has centered around conservative speakers’ “complaining about an atmosphere of intense pushback and protest that has made some speakers hesitant to express their views and has subjected others to a range of social pressure and backlash, from shaming and ostracism to boycotts and economic reprisal,” as Thomas Healy wrote for The Atlantic. The answer to hateful speech is more speech, according to the cliché, but that doesn’t seem to apply to college kids condemning intentionally provocative reactionaries, even when their protests are nonviolent. Left unstated but implied in Lennard’s piece is that Spencer’s apparent withdrawal from the campus wars not only proves that standing up to Nazis makes it harder to be a Nazi, but also vindicates all of antifa’s tactics, including fighting them in the streets. Does it? On the left, there’s been a long-standing debate about whether violence, specifically, is self-defeating. Antifa may well be making Spencer’s life hell, but the unknown unknown here is whether they’d be more or less effective if they focused exclusively on nonviolent tactics. As viscerally satisfying as punching Nazis may be (and I won’t deny enjoying that viral video as much as anyone), it’s clear that far-right groups have enjoyed significant success recruiting thugs to duke it out with antifa activists. Mark Bray argues that antifa violence is primarily about self-defense—and that was the case in Charlottesville, where police appeared to hold back while Nazis ran amok—but in places like Berkeley, California; and Portland, Oregon, both sides come ready to fight in what has become a predictable dance of violent confrontation. 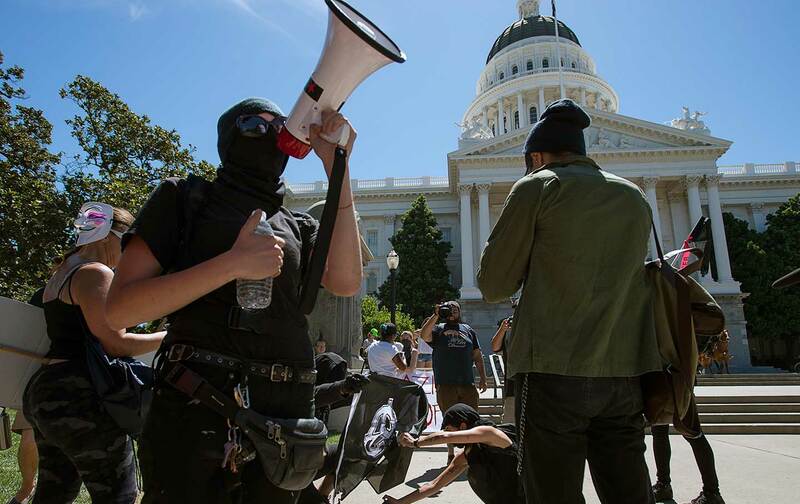 Antifa’s big-picture strategy—making it clear that inherently violent, racist ideologies are not acceptable in a pluralistic society and creating a tangible cost for those who adhere to them—is laudable. But given that most of what they do is in fact nonviolent, they have a public-relations problem that stems entirely from the widespread perception that they represent a mirror image of their fascist opponents. In addition to doxing fascists and depriving them of venues, antifa activists have engaged in a number of creative tactics that haven’t resulted in the same kind of blow-back as they’ve gotten for rumbling with white-nationalist goons. White-supremacist websites have been systematically kicked off of large swaths of the Internet. Klansmen have been sent packing by the mockery of activist clowns in Knoxville, Tennessee. In Germany, a town responded to a white-supremacist march by “sponsoring” its participants—raising money for anti-fascist groups on the backs of the very fascists they oppose. It should matter to other progressives. As I wrote last year, since the end of the Vietnam era, the far right has held a near-monopoly on political violence in the United States. So while violent confrontation is just one antifa tactic out of many, in addition to being a potent recruiting tool for right-wing hoodlums, it also muddies the waters around the primary source of political violence in America. That’s a problem for everyone.